Filed Under: Greetings from . . .
226 Comments on "Where are you from?" Warm greetings from the Gold Coast , Australia. I live in Jacksonville Florida. Thank you so much , i absolutely adore your kitchen ! from linda in Wales . Greetings from Ecuador South America . Hi Jenny. I am from Denmark. A very warm “Thank you” from Indonesia! You’re wonderful, Jenny! I came across your quick no knead bread and watched the video and I said to myself hey I know her from somewhere and sure enough its from the jenny jones show. I am happy to find your site and find you well. I am in Saskatoon Sask Canada. Just wanted to thank you for sharing this cooking. I am from Canada and first saw you on your talk show then just recently stumbled onto your videos on you tube, then visited your website. I had a major heart attack a couple years back and changed my life completely by quitting smoking and also what I eat. I have found it very hard to eat healthy and enjoy healthy food, UNTIL you came into my life!!! So, thank you so much for the absolutely fantastic food that is also healthy. You have taught me a lot about reducing the fat in cooking and I cant explain how much I appreciate that. I’m from Canada too (London, Ontario). Changing habits isn’t easy so I’m glad my recipes are a part of your road to better health. Thanks for taking time to share your experience. Big hugs from the island Cyprus in mediterranean sea !!!! Love your great recipes, Linda from Australia﻿. Love all your recipes. Thank you Jenny…from South Africa. I’m from the High Desert area of California. I just discovered your website about a month ago and I love your subtle, dry sense of humor as well as your great recipes. I had a Jenny-Can-Cook dinner for a few of our friends over the weekend and it was a great success. I made your 2 Hour Fastest No Knead Bread, Easy Baked Ziti, and Caesar salad dressing for my salad. Everything turned out very good and I received lots of compliments, which I now extent to you. Your recipes are very easy to understand and to prepare; your videos are a huge help when attempting new things (and extremely entertaining). Cheers from Curitiba, Brasil, a city with a lot of Polish heritage. I just love your recipes! Hugs from Brasil! Dear Jenny. Hello from Britain. I’m your fan from Egypt. hello there from india! just chanced upon yr video n found it n you fascinating. cant decide what i liked more–the recipe or your rib tickling humour. Poway Ca.Most of my adult hood was in the chicago area . Greetings from Kawawachikamach, Schefferville, Quebec. bravo Jenny from Chania Crete! Hello Jenny, I found you on the internet and enjoy you so much. Laugh at your missing gloves and then a chicken brings them to you. You are so funny. Your recipes are great. Hi from Port Rowan Ontario Canada. My wife, Beth, recently corresponded with you regarding the amount of flour to use in your Blondies recipe. They turned out great! In the meantime, Beth and I have viewed several of your videos. As a former Army battalion surgeon, family medicine physician, and pediatrician, I am thoroughly impressed with your recipes; not only are they easy to follow and delicious, but they are “clean and healthy” as well. I am convinced that we in the medical community would see a much lower rate of obesity, diabetes, and other diseases if more people used your recipes and followed your advice regarding food preparation. Without hesitation, I would refer a friend or a patient to your website if he or she wanted to get on a path towards better nutrition and better health. Your recipes/videos are the best I have seen, and I would endorse them as such! Keep up the good work! What a lovely note – thank you so much. It’s really nice to know that what I share might be making a difference. Hi miss Jenny nice to meet you I’m from Japan. Watching your videos from Guam. Thank you for your recipes. Your meatloave is the best I’ve ever tried. Jen, I love your videos. I remember when you had your TV show. But what you are doing now is more interesting, entertaining and I am constantly learning from you. I subscribed to your “you tube” channel and check out your videos every day. Thank you for everything and please don’t stop. My name is Viola. I live in East Orange, NJ USA. I went to YouTube looking for one thing about teeth and found myself on your site. I did find info on my first search but then, saw something else I am interested in and that is “no yeast breads”. After reading and listening to your words, I became convinced that you are a good teacher for me. My interest in baking other than quick breads, which I love, has been pumped up to the point of “wanting to try it”. You do a good job of show and tell which I need to encourage me to just do it. Keep it coming lady, and best wishes on your nice site. Greetings from Paris. ! ‘ve just discovered your channel, I like to cook from time to time and specially cakes and other sweets… My sister cooks as well and used to teach English in France so she will be very pleased to cook in English like me. Go on ! you’re so congenial ! Hello from Easton, Maryland which is 45 minute south of Annapolis. I am loving your site 😋. Your videos are not only fun to watch but I like the fact your recipes are easy to make and so so delicious. Thankyou. HI Jenny, so glad found your website. What amazing recipes. I have made the no knead six times already. Lots of great healthy recipes. Keep up the great work. You make me smile when I watch your videos as you always are so upbeat and have fun in the kitchen. I’m a granny now, and used to be a professional chef, so I know how to cook pretty well, but your recipes are so easy and tasty that I like cooking them! I moved from the USA to Sydney (Australia, not Nova Scotia) 40 years ago. Sometimes I can’t get North American ingredients, but usually can muddle through with something found locally. i love the way how you cook!!!! hi from Puerto Rico!!!! Much love from South Africa! I am Egyptian guy, I am civil Engineer but I like to spend all my non working time in the kitchen, I just want say thank you sooooooooo much, you are very clever. I’m American (from the Midwest) but I’ve lived in Germany for the last 26 years (half my life). I thought I was coming over for about a year or two. Oh, well. I just discovered you and your website this year and am so grateful for what you do here. Thank you from the bottom of my heart, stock pan and apron for all the energy, time, hard work, generosity and, obviously, passion you have put into creating and maintaining this site and your videos. You help me get over waves of homesickness every once in a while and you’re helping me become an even better cook and baker… thank you. In this day and age when so many bloggers are looking for ways to monetize their talents, you present us with such wonderful free gifts (your cookbook, no-ads policy, no sponsored product recommendations, etc.) That deserves an extra THANK YOU! I just read in the “Ask Me” section that you turned 70 this year, and I’m flabbergasted. Your looks and energy level would NEVER have given your age away! What a great example you set for a healthy lifestyle. Thanks for sharing your gifts with the rest of the world, and thank you, Internet, for making it possible for me over here to benefit from you over there! Thanks for taking time to send such a nice note. Hi Jenny, I am from Sussex in the UK. I tried your Salmon Patties and they turned out first time, well done.!!! Now I am looking at trying your bread and roll recipes. Hello! I am French and I live in India. Your no knead bread recipe is amazing: I used to say I miss bread, now I make it myself and it looks and tastes like it’s from the bakery 🙂 I have been sharing it with lots of people. Thank you so much! Love Your sense of humor…greetings from Holland!!! I am from Bangalore, India. Love your videos! hi , Jenny. I am from Rio de Janeiro, Brazil. I love your recipes. Hello all the way from Namibia!!!!!! Am passionate about cooking and luv your polish recipes. Just chanced on your site the other day and fell in love with the way you explain and the ease at which you churn out your dishes. Shall soon try them out and post the pictures. Hi from Newcastle, Northeast England. I used to watch you on tv many years ago when I liven in Chattanooga, TN, I really loved your personality and that has not changed, You and I share the passion and love for cooking good food I You are beautiful and I love to watch your videos, I was born Serbian,, I became an American and I live with my husband in Germany.So you can count three countries right here. Keep this up as long as you can because we love you Jenny!! Jenny, I am 81 years old, from Switzerland, and have been delighted with your no knead bread recipes! Thank you so much and on top, your are such a nice person! Regards from grandmother Colette ! WOW, I LIKE YOUR RECIPES, HI FROM COLOMBIA, SOUTH AMERICA. found you…while searching for bread. and now I just love you. you are so good. greetings from India. I am a Sri Lankan and live in the capital city Colombo, Sri Lanka. Sri Lanka is a beautiful island in South Asiavin the Indian Ocean. All the best to you. I love your recipes…Thank You for your time. All the way from Africa Jenny. You are a great cook and an awesome entertainer. hugs from Buenos Aires, Argentina. Greetings from Australia. What a wonderful and generous website, Jenny – can’t wait to try your no-knead bread – and lots of other recipes! Hi Jennie From right here in the good old USA. I live in Northern New York .State. Up on the Canadian border. Love looking at your recipes. I am a bread baker. Have not had that great a luck with the whole wheat. I will be trying your recipe tomorrow. I’ll let you know how it comes out. I live in Venzuela.thank you very much for your recipes they r super good. Warm regards from Istanbul, Turkey. Blessings and hugs from the tropical caribbean island of Puerto Rico. Hello Jenny, Greetings from Toronto Canada (Harbourfront). Wanted to express my gratitude. Love your recipes and videos. Jenny, I am from myanmar and I am trying to bake my own bread. Your video is very useful for me. Before watching yours, my own making bread is just only for my dog. Now, I am quite ok and will try to open my own bread shop. 🙂 ;)﻿ Thank you. Good luck with your bread shop! Hello Jenny! Greetings from Croatia! I’ve already sent you a picture of my no knead bread yesterday, and it seems you liked it, you posted it. I used to watch the Jenny Show many years ago. You still look amazing, Time stood still for you, You are so beautiful, Your friend and fan. Lisa from Prince Edward Island Canada. Reciba un cordial saludo desde Venezuela! Hey Jenny my name is Sueallen from Goa, India. Greetings from Lima, Peru; Jenny, you’re the best. Jenny i miss your talk show but i’m glad to have found your cooking channel.Love you so much and greetings from Ottawa,Ontario. Hello from Cuenca, Ecuador ! Made the meat sauce last night. Excellent. How about a healthy recipe for corn bread ? hello , i tried your doughnut recipe today and they came out brilliant and tasty. i am from mauritius. Whe are real fans of you en eat a lot of you’re recipies here in Belgium! Hope that you knever stopped!!! Hi Jenny! I thought you looked familiar! Great to see you again. I can’t wait to try out the pierogi recipe for my husband this Christmas. His family was Polish and they’re all gone now, so it would make him very happy to have homemade again! Greetings and Happy Holidays (all of them!) from Brooklyn, New York! I,ve seen your site now better and thank you once again for the messurescale.Wish you luck with your youtube movies. I watch them now in Holland ( The Netherlands ) Tot ziens en veel geluk! = Ductch for See you and good luck! Lennie-Ester. 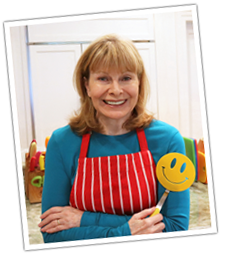 I think you are so jolly and I love your kitchen and all of the colourful spatulas. You are a feel good person. best wishes Ann in South Australia. I’m a BIG fan of yours! Hello from Singapore! Very nice recipes, I going to try. Thx u Jenny from Thailand fan. hello from japan! WE LOVE YOU, MISS JENNY!!!!!!!! you just make cooking so fun. you will make a great cooking show host. pace is great, not tmi and you have the skill to impart confidence to beginner. Your fan club from Bangkok, Thailand. Hi jenny. I reside in nigeria. I tried your recipe yesterday. Gosh!, I am still smiling. My husband loves your apple pie. Hello from British Columbia, Canada. I am so enjoying your recipes. Breads have always intimidated me, but you make it easy. I love all your recipes and the videos demonstrating the process of each. Cheers! Greetings from the Philippines, i would just like to thank you for giving simple yet great tasting recipes. Hello from Bath, Maine! (We’re still trying to sell a house in Port Jervis, NY so we can retire here permanently!) I think I found your site by “googling” Polish recipes for my husband. Turns out that I haven’t made any of those but we’re addicted to the Chicken Pot Pie and the 90-minute Wheat Bread! There are sooo many more recipes that I’m hoping to try. I’ve “introduced” you to my niece who lives in Topsham, Maine and together, we’re going to try more! By the way, we both LOVE your sense of humor and your kitchen timers! Greetings from Bosnia and Herzegovina. You are so great and I looove all your recipes! Hi dear Jenny. My name s Tuya. i m Mongolian I like your channel . i ve learned cabbage roll from you and I cook very well when i cook something always search you even i buy kitchen staff like you. thank you very much. Hola from puerto vallarta mexico. Hello from Edinburg, New York. Thank you so much for your recipes – they are fabulous – and so is your sense of humour. Hello from The Netherlands (aka Holland 🙂 ) . Was looking for a recipe for Cinnamon Rolls, came across your video for them on youtube. I just had to subscribe to your youtube channel. So many good cooking ideas. Truly have enjoyed watching you on tv and now in the kitchen! Thanks for making cooking fun for me! Love your sense of humor! We enjoy all your recipes. Keep posting! Regards from Nova Scotia, Canada. I use to watch your tv show. I stumbled upon your website doing a search. What a pleasant surprise! I also found what I was looking for. Thanks. is crazy about you too and the word is spreading!! I love, love, love your cooking presentations! You are the greatest! My husband and I hate all peppers and cilantro (actually makes us sick, don’t know why). They’re often in recipes I would like to make. What would be a good substitute? Love your site and videos! Peppers, especially the red and yellow ones add flavor and color to recipes and I can’t think of a great substitute. You could try celery, carrots or maybe seeded tomatoes in a recipe. For cilantro, of course parsley has lots of flavor, watercress is highly nutritious, and celery leaves might be a good substitute. That’s all I can think of. greeting from kenya that’s in Africa i love you cooking i have tried some of them and they out come is good. Hi Jenny!! Lotsa sunshine and love from Malaysia. Thank you for many simple recipes that you have for us.. Keep them coming! Go Jenny Go!!! I am from Malaysia. Love your recipes and video. Keep it up, Jenny! Hi Jenny,I am Wendy from Kansas. I feel like I have found an old friend, love your web site. I love your videos and recipes. They are very easy to follow. Greetings from China Jenny! You are freaking awesome! I am Maryam, Iranian, living in Michigan currently. I just found you on u tube, I subscribed right away! no need to say how much pleasure I get by watching your awesome videos! please, please, please make more! mmmwwwaaahh! Hi jenny I am from the caribbean. Hello, Indiana (Hoosier) here.. LOVE your recipes. Ty for all the good ideas and tips.. Keep them coming..
Hello from Tucson, AZ ! I used to watch your TV show (many moons ago). I enjoy your blog & all the recipes. I found you on youtube about a week ago and I just fell in love with you right away. You recipes have a home touch to them and I really like that. Hello from Spain!! Love your recipes and videos!!! Hello from Cape Coral, Florida! Greetings from Michigan. I’ve just discovered the site and have read/viewed the entire site in two days. I especially love your videos. I’m waiting for more. love your sense of humor. I am from California. I really learnt a lot abt cooking from u so just wanted to express my gratitude. You really are a true inspiration. Thanks a Ton for being there !! I’ve never been but I would love to visit New Zealand some day! I’m currently watching Hottest Home Baker! Hello Jenny. Greetings from the Phillipines! we enjoy so much your recipes.